Golf isn't everything at Desert Highlands. But if it were, for many that would be enough. One of the most desirable features is the fact that when you purchase a home or homesite at Desert Highlands, membership to the golf club is included with a membership fee. The highlight of that membership for many is the ability to play the acclaimed course designed by Jack Nicklaus. Accolades for the Desert Highlands golf course have included being ranked as one of the top desert golf courses in the country by Golf Digest. Yet first proof that this course was something extraordinary occurred almost immediately after it was completed. Desert Highlands was the site of the first two Skins Games in 1983 and 1984. When you play this course you walk in the footsteps of Jack Nicklaus, Arnold Palmer, Tom Watson and Gary Player. Yet even as you feel the atmosphere of legends around you, Nicklaus designed this course to invite players of all levels to enjoy the challenge, while also savoring a setting that is nothing less than magnificent. Pinnacle Peak looms just overhead and the lights of the Valley spread across the horizon in the distance below. A dramatic elevated tee box on the first hole sets the tone on this 18-hole, par 72 golf course that plays 7,072 yards from the tips. To enhance the desert effect, turf has been used judiciously which has resulted in a "target golf" concept. With major desert areas abutting the fairways and greens, the turf limitation has served to heighten the visual drama of the course. The result is reminiscent of a soft-flowing green carpet draped across rugged lands forms. Please call 480-585-8521 for current rates. 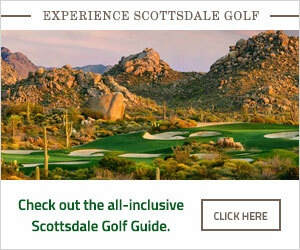 Call 480-585-8521 for rates and tee times. Contact Desert Highlands Golf Club at 480-585-8521 for more information and details on holding a golf outing at the course. Contact Desert Highlands Golf Club at 480-585-8521. Contact Desert Highlands Golf Club at 480-585-8521 for onsite or nearby dining options. This profile was last updated on 11/05/2018 and has been viewed 6,900 times.